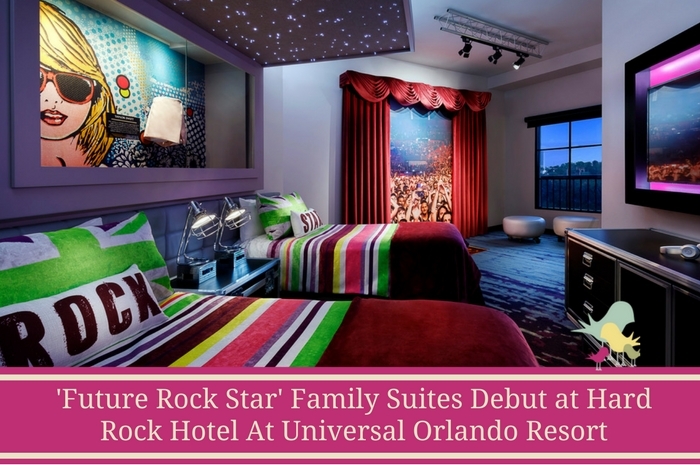 Today, Hard Rock Hotel at Universal Orlando Resort debuted their redesigned Future Rock Star Suites, designed to capture the excitement of being on tour and performing under the lights. 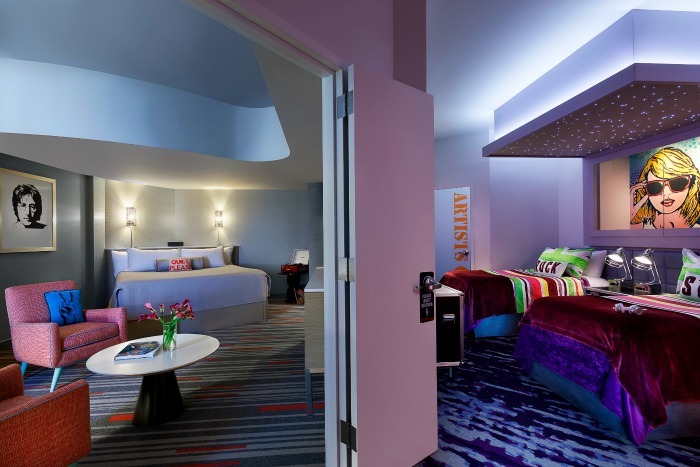 In addition to the bright colors and decor, each suite features an item once donned by a music celebrity making it the first time memorabilia has been installed inside a guest room at Hard Rock Hotel at Universal Orlando. These two-room suites feature details inside each room to make you feel like you’ve taken to the stage yourself. Including a stage with liquid flooring and lights, a twinkling starlight canopy over the beds and unique memorabilia in each room — guests will be living the life of a rock star. 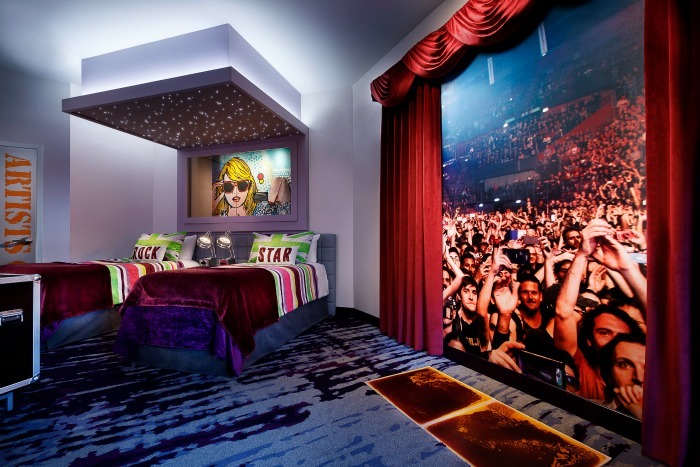 Designed for families with tweens, teens and any kid – Every Future Rock Star Suite consists of a king room that connects through a “stage door” to a room with two twin beds and roadie case-inspired furniture. Sign me up! 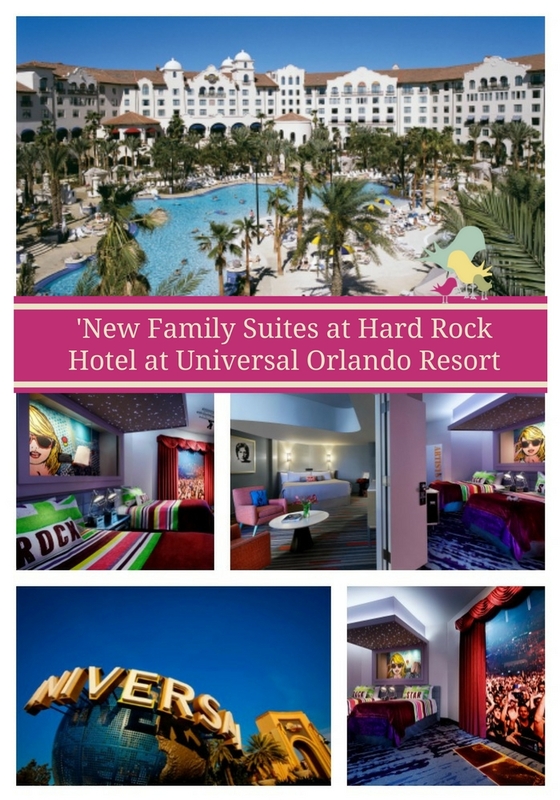 Staying at the Hard Rock Hotel at Universal Orlando Resort comes with some pretty great perks too – no matter your room preference. The Sound of Your Stay is a complimentary, in-room music amenity program offering experiences for guests to jam out on a selection of Fender guitars or tune into the resurgence of vinyl records while listening to them on a Crosley turntable. 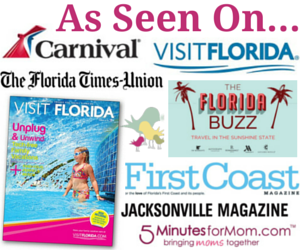 Other amenities include being just a short walk, complimentary water taxi or shuttle bus ride away from all three Universal Orlando Resort theme parks. Resort guests also receive free Universal Express Unlimited ride access (theme park admission required) to Universal Studios Florida and Universal’s Islands of Adventure as well as Early Park Admission to The Wizarding World of Harry Potter and Universal’s Volcano Bay one hour before the theme parks open. I know these family suites are geared toward tweens and teens, but I’m certain my girls (ages 7 and 9) would absolutely love being ‘on stage’ in our room. I can just picture the singing, the dancing — and great memories families can make together in these rooms. Next time i’m in Orlando I will have to check this out!